JIRA Agile has come a long way from the days of the GreenHopper plugin. It’s now pretty well integrated into JIRA and I’ve found it great for running an Agile workflow. 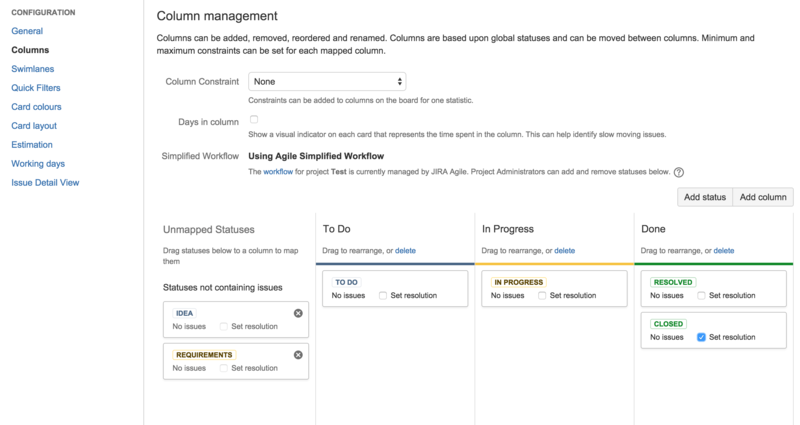 JIRA Agile supports both Scrum and Kanban boards so you can manage your tickets using whichever methodology you prefer but what if different parts of your team want or need to work in different ways? With JIRA Agile you can have multiple boards so tickets flow through different teams in different ways. Maybe your developers are using Scrum with week long sprints. They want a standard Scrum board where they can take tickets from the To Do column, move them into In Progress when work starts and then to Done when complete. But perhaps weekly sprints don’t really suit the planning workflow of your product team. They would prefer to use a Kanban approach of managing their work in progress. Ideally we want to be able to create tickets on the product team’s board and move them into the developers’ board when they are at a suitable stage of readiness. By mapping statuses you can have a kind of combined Kanban/Scrum process. This is a Kanban board with 5 columns: Backlog, Requirements, Ready for development, Test and Ready for release. Each column is mapped to the following respective Statuses: IDEA, REQUIREMENTS, TO DO, RESOLVED and CLOSED. The IN PROGRESS status is left unmapped so tickets in this state will not show up on the board. The product team can work on tickets in the Backlog and Requirements phases before moving them to the Ready for development column which will cause them to show up in the Development Scrum board (as we will see). Once the developers have completed a ticket it can be moved into the RESOLVED state and it will then reappear on the Product board in the Test column. When the product owner is happy that the requirements have been met it can be moved to the Ready for release column. This is a Scrum board with the standard three columns: To Do, In Progress and Done. Some tickets may not need to be sent back to product for review and can be closed directly so the Done column has both RESOLVED and CLOSED statuses. When planning a sprint, the Development board will only show those tickets with a status of TO DO in the backlog. Tickets that are still being prepared by the product team (IDEA and REQUIREMENTS) are left unmapped so won’t show up until they are ready to be scheduled into a sprint. Once a ticket is moved into the RESOLVED state it will reappear on the Product board. By combining Scrum and Kanban boards you can create a hybrid workflow that better suits the needs of the people actually working on the tickets. You don’t need to force everyone into a single way of working. Great stuff. Any advice for how to break down larger stories into smaller ones within Jira? I’ve used a workflow very similar to this that adds in decomposition of stories in Kanban; you start with large, non-specific stories, and work them across the board to break them into smaller ones in preparation for scrum (production). That does sound similar. As far as splitting up tasks goes, you can use subtasks in JIRA but personally, I prefer to stick with top-level tasks + links as required. If you find you have a large, poorly defined ticket and you want to refine it in a scrum workflow maybe you could turn it into a task to define the actual smaller tickets to achieve the larger story. Me Likey … Always looked into a way to combine these two workflows without having multiple projects. Thanks for this write-up. We are trying to do something very similar. However, we are having some issues. I am wondering what the workflows look like for this to work? Can you please provide more details? Ravindra, the JIRA workflows don’t really matter as long as the tickets are allowed to move between the statuses in the life cycle. It’s easier if tickets are allowed to be moved to any status from any status. The important part is mapping the statuses to the appropriate columns on your boards. I would suggest you decide the full life cycle of a ticket across all the boards and then map each status in that life cycle to the board you want it to appear on. So in this case, our tickets have the following status life cycle: IDEA -> REQUIREMENTS -> TODO -> IN PROGRESS -> RESOLVED -> CLOSED. You then map the appropriate statues to the appropriate boards and they will appear/disappear as they move through the life cycle. Kermie, I’ve used subtasks for QA/testing tasks before. The main ticket is used for the development work and the subtask is for testing (and any other things that might be needed). This works pretty well and tightly links the QA work with the development work without having to remember to link the tickets manually. You can even close the main ticket and leave the subtasks open. I’m not sure if there is a limitation on closing JIRA sprints with tickets with open subtasks but it definitely works on a Kanban board.